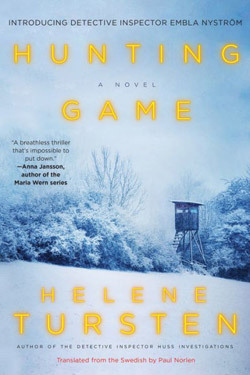 Swedish author Helene Tursten has gone against type over the last decade to create the highly praised Detective Inspector Embla Nystrom mysteries, including her latest installment in the series, Hunting Game, just released in the United States. Many of today’s most popular Scandinavian murder mysteries tend toward bloody violence perpetrated by sullen sickos under brooding gray skies ready to downpour at any moment. Rain still falls in Hunting Game; the mystery is set in the drizzly backcountry of Tursten’s damp homeland, after all. But there is an underlying sunniness to homicide investigator Embla that lends Hunting Game a welcome sense of conviviality — or, dare it be said, hygge — in the face of life’s sometimes fiendishness. Embla runs against type as a Nordic female, too. In her free time, she is a prize-winning welterweight boxer and an experienced hunter. The plot of Hunting Game turns on the latter of those pastimes, when Embla takes a vacation from her stressful detective job to participate in the annual elk hunt of her family and friends. Embla finds upon her arrival at her uncle’s cabin in rural Sweden that an unfamiliar face has joined the hunting group: computer expert Peter Hansson, wealthy, secretive, handsome, and newly divorced. In the wake of his divorce, Peter has gutted and rebuilt his old family mansion in the countryside near the hunting camp, complete with private, sealed-off rooms and a high-tech security system. After laying eyes on Peter, Embla declares him a ‘hottie’ to a female friend joining her on the hunt. Her growing interest in the enigmatic newcomer leads her to call on her professional skills to surreptitiously explore his suspicious home. Hunting Game unfolds at a leisurely pace in conjunction with the commencement of the multi-day hunt. Readers come to know the hunting party’s quirky members, who are sure to become suspects when the inevitable murder occurs. Before that defining event, the appearance of a ghostly apparition at the hunting camp and the placement of a venomous snake in the camp outhouse serve as harbingers of the deadly dealings to come. The tale revs up when two members of the hunting party go missing and one of them is found floating facedown in a lake on the hunting grounds. Given her personal involvement in the hunt and her position with the police force, Embla is drawn deep into the case. As she investigates, her decision-making skills are tested by her attraction to Peter, to her and others’ peril. The tension between Embla’s dueling workvs.- life sensibilities makes Tursten’s Hunting Game a pleasure to read—without the depressing wade through blood, gore, and existential gloom typical of so many murder mysteries by Scandinavian authors these days. Scott Graham is the National Outdoor Book Award-winning author of the National Park Mystery series for Torrey House Press. The fifth book in the series, Arches Enemy, will be released in June. It is available for preorder at scottfranklingraham.com.